JUST Bikes, formerly known as the Madison Bicycle Equity Group, unveiled four self-fix bicycle station, new bike racks, and recognized graduates of the Mobile Bike Repair internship program on Wednesday at Centro Hispano. 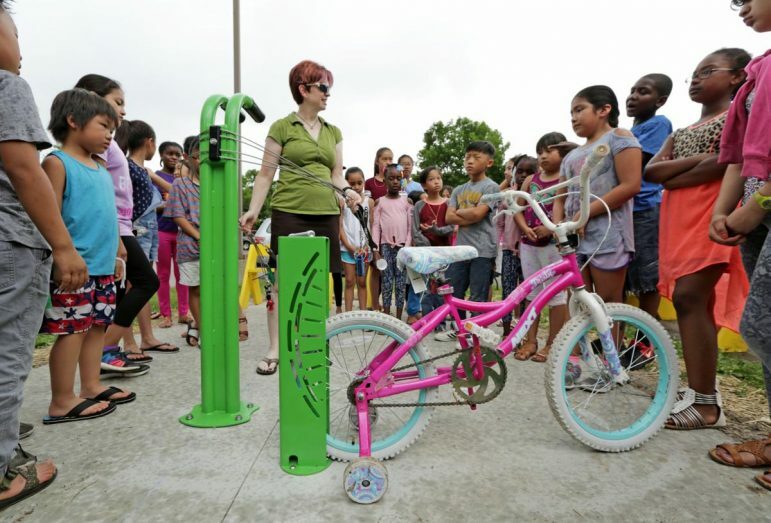 Renee Callaway, of the Madison Area Transportation Planning Board, talks to a group of children during the unveiling of the new bicycle repair station outside the Bayview Community Center in Madison in June. The projects were made possible by Madison Community Foundation’s 75th Anniversary Year of Giving grant “Mad About Bikes.” Mad About Bikes provides access for all riders, regardless of economic status, and helps them take advantage of Madison’s Platinum-level status as a Bicycle Friendly Community. The $84,200 grant included a 1,100-bicycle giveaway in March, the installment of public fix-it stations, bike repair internships for community youth, starter bicycles for beginning riders, safety education and repair training for riders of all ages, and an electric-assist bicycle outfitted as a repair vehicle that travels throughout the city. Just Bikes’ Fix-it Bicycle Stations are equipped with various tools needed to keep bikes in working shape. The other fix-it stations were installed during the summer, and are located at Badger Rock Neighborhood Center, Bayiew Community Center, and Lussier Community Education Center. In political news this past week: Chris Rickert Wisconsin State Journal reported on Madison residents discussing Gov. Walker’s $100 per child rebate asking: good politics or pandering? Foxconn disputed reports that it's already changing plans for its Wisconsin plant from Mark Sommerhauser, Wisconsin State Journal. The Madison Community Foundation announced this month a $75,000 grant intended to help local community organizations utilize wood from ash trees felled by the invasive emerald ash borer insect for educational and artistic projects. This grant represents the tenth in a series of twelve major community donations made by the Madison Community Foundation, which pledged an approximate $1 million toward various local causes through the twelve gifts.